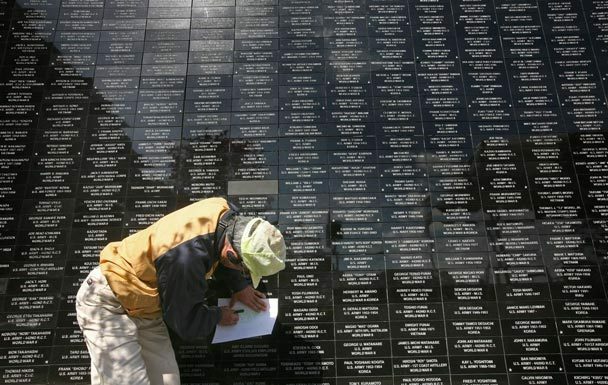 Three thousand bricks now make up a memorial wall in Seattle's Chinatown International District to honor Japanese-American soldiers. Names are carved in black granite bricks that are stacked to create a wall 12 feet high and nearly 100 feet long. On Sunday afternoon a large crowd gathered as the NVC Foundation formally dedicated the wall with a special ceremony. Susan Shinoda was in high school when she first learned that more than 110,000 people of Japanese ancestry — two-thirds of them American born — were shipped off to internment camps as war hysteria mounted in the months following the Japanese attack on Pearl Harbor in December 1941. Three generations of Shinoda's own family, including her father, spent several years during World War II at the Minidoka camp in Idaho. 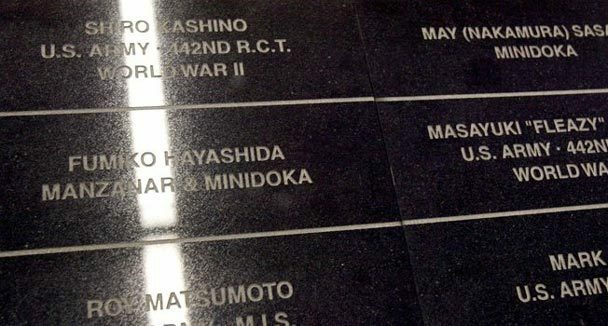 Among them was her grandfather, Michio Shinoda, who volunteered to serve in the U.S. Army's Military Intelligence Service. "It's odd. They don't really talk about it. My family rarely talks about going to camp," said Shinoda, a 34-year-old software program manager who was born in Seattle and grew up in North Bend. "I can't imagine doing that: Your family is in camp and you're fighting for your country that's incarcerated the rest of your family." Their families were torn apart during wartime - sent to internment camps for years. But now a legacy has come together for the families of the Japanese-American community of Western Washington to remember so many who sacrificed. The hands-on project is taking shape in Seattle's International District. A memorial wall is being covered in bricks. Each brick bears a name - and every person shares a story. All are woven into the fabric of American history. "Can you imagine ... being uprooted - and only able to take what you can carry? I mean, not knowing what your future was going to be?" says Helen Nishimura of Bellevue. One plans to honor his mother, another his uncles and father. Louise Kashino plans to honor her husband, and her daughters plan to honor her. Each is behind a memorial wall they say will be unique, to be built in Seattle's Chinatown International District in honor of people of Japanese ancestry who were interned during World War II, served in the U.S. military — or, in some cases, both. "The first and second generations have established a legacy that's second to none," said Keith Yamaguchi, commander of Seattle's Nisei Veterans Committee. "... I don't think people really understand their hardships and the garbage they had to put up with."